Delicious short bread biscuits with a dove shape, dedicated to Easter period or any time of the year. They contain an apricot heart. Perfect biscuits for tea time. Ingredients “pasta frolla”: WHEAT flour, margarine (vegetable oils and fats - palm and canola - water, 2% concentrated BUTTER, MILK whey powder, salt, emulsifiers: mono and diglycerides of fatty acids, SOY lecithin and sunflower, honey, flavorings, preservatives: potassium sorbate, acidifier: citric acid, color: beta-carotene), sugar, EGGS, rice flour, raising agents (sodium diphosphate, sodium carbonate, WHEAT starch, anti-caking agent: calcium carbonate), MILK serum, honey, salt, emulsifier: soy lecithin, flavorings. 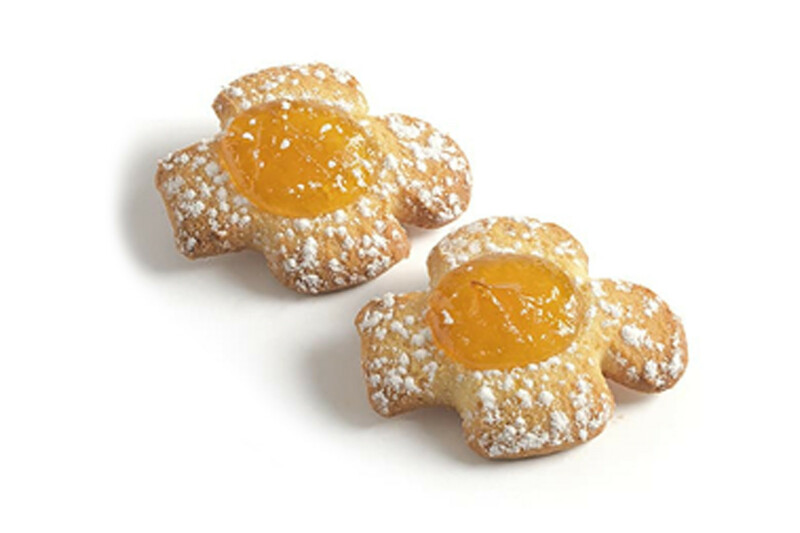 Ingredients apricot filling 25%: glucose-fructose syrup, 45% apricot purée, sugar, gelling agent: pectin, acidity regulator: citric acid, preservative: potassium sorbate, flavorings. May contain traces of nuts (ALMOND).